Rail workers on some of the busiest routes in the country will stage a fresh strike today. Members of the Rail, Maritime and Transport (RMT) union on South Western Railway will walk out for 24 hours, with further action planned on New Year's Eve. This is the latest strike in a long-running dispute over guards on trains, causing more travel misery for passengers. Passengers have already endured a year of misery with train punctuality slumping to a 13-year low after strikes, poor weather, signalling problems and timetable chaos plagued the network. One in seven trains failed to meet punctuality targets, according to regulators at the Office of Rail and Road. Picket lines will be mounted outside stations, including London Waterloo. The union claimed the cost to the taxpayer of the Government 'bailing out' South Western on strike days will be more than £26 million by New Year's Eve. 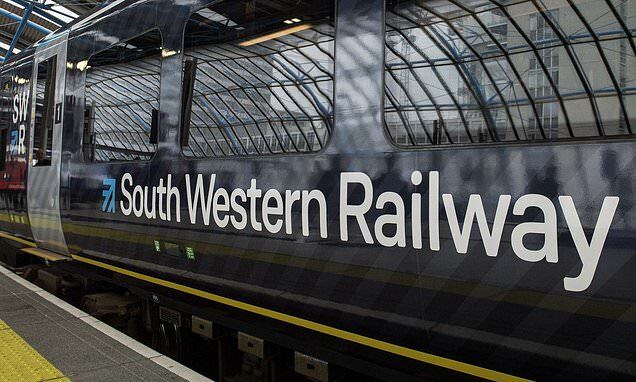 The union said that prior to his resignation as Rail Minister Jo Johnson admitted to MPs that South Western had made an application to be reimbursed for revenues lost as a result of industrial action. RMT general secretary Mick Cash said: 'Official parliamentary answers have shown that the government is preparing to bail out South Western Railway for revenues lost as a result of strike action.